While taking pictures of a pretty girl that wants to be a model Jimmy Olsen stumbles across the body of Garrett Remington, a reporter from Gotham City. Perry gives Clark the story because Garrett was a friend of his and had apparently unmasked Batman. White wants to nail Batman to the wall despite Clark's protestations that Batman is a good man. Clark works on the beginnings of his story on the train ride to Gotham putting out a fire along the way. After avoiding a mugger Clark meets with Batman who tells the reporter to stay off the case. Later Batman discusses the autopsy with Alfred on his way to Garrett's apartment. There he makes a startling discovery. Garrett had figured out that Batman was Bruce Wayne. The police arrive forcing Batman to torch the evidence that Garrett had assembled. Meanwhile, Gotham Gazette editor Martin Mayne begrudgingly agrees to let Clark work the story. He tries to locate Martin's files but can't find them. A 52E comes over the police scanner which Clark mistakes for arson. Martin corrects him by explaining it is actually the code for explosives and Clark is off like a shot. Superman arrives at the scene and is told by Commissioner Gordon that his help is not needed and that this whole thing has been blown out of proportions. Batman started the fire and then put it out with a special retardant. Gordon asks Superman to talk some sense into Batman. At the same time Batman eludes the police and thinks about the fact that he doesn't make mistakes often. Superman catches up with him and the Dark Knight explains that Garrett had been collecting tech Batman has left around the city and found a patent number that Batman had forgotten to remove. From that number Garrett discovered a paper trail that proved that Bruce Wayne had been pilfering tech from WayneTech, which at the time was a publicly traded company. Technically Bruce was defrauding the stock holders. Superman tells him that he has to finish this story. Batman counters that not everyone is invincible and that he does what he has to do because the city needs him. Superman asks Batman to let him help but the Dark Knight leaves stating he doesn't need it. 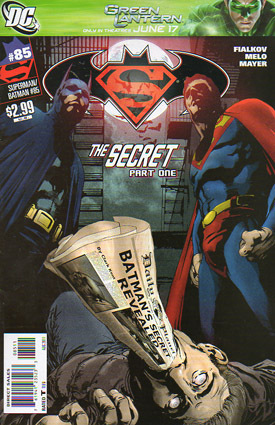 Story - 5: This is the best issue of SUPERMAN/BATMAN that I have read in years. I don't even know where to begin. Joshua Fialkov hit the ground running at the beginning of this issue and never stopped. It was well paced, tightly plotted and grabbed me from the very first page. Fialkov took a plot idea that has been done before (someone has figured out a hero's identity and the hero has to figure out a way around it) and did something different with it. Not only is the character that figured out the big secret dead and not only is Batman a suspect in the crime but the character, Garrett, uncovered another crime in the process. I have never put much thought into how Batman arms himself and gets some of his tech. Around 1994 writer Chuck Dixon put it out there that he got most of it from WayneTech and the movie BATMAN BEGINS took that idea and ran with it. That's really all I needed to know. It never occurred to me that because WayneTech was a publicly traded company at the time that Bruce was defrauding the stock holders by taking the little bit of tech that he didn't machine himself. I don't know how this would work in the real world but for a comic book story it plays out nicely. The characterization was spot on as well throughout the issue. It was nice seeing Clark Kent again and it was even nicer seeing Clark Kent doing some actual reporting instead of just standing around the office until he was needed as Superman or, you know, not really being there at all. I was especially taken with the scene on the train because it showed us how Clark works as a reporter right down to the shorthand he uses. I wasn't quite sure what was happening at first with the two panels where the narration is the same but then it hit me that we were seeing the same note twice because Clark had stopped writing to take care of the fire. This worked on two levels. One, it was a neat use of the medium to show that a character had stopped writing and went to take care of something. Two, I like the idea that not everything Superman does is world shattering. Sometimes he just takes care of a fire. It may seem kind of random but it goes to prove that Superman will help everyone no matter the scale of the problem. Sure he'll stop Darkseid or Brainiac or any of the other world beaters but if he happens to spot a fire or mugging or whatever he'll take care of that too. I also dug the bit with the mugger. It made me smile. Fialkov continued to win me over with his take on the Batman. Too often Batman is treated as the most awesome character that has ever existed and he is always right and never makes a mistake. This happens in SUPERMAN/BATMAN and it happens in other books as well. Frankly I blame Grant Morrison for this. As much as I liked his run on JLA it was in that title that the idea of "Batman: Master of Everything" really began. Fialkov bucked that trend here. Batman not only made a mistake by not filing off the patent number early in his career but also by insisting he needs to work alone. It is nice to see Batman caught with his pants down, so to speak. He needs help but won't accept it when it is offered. This adds to the depth of the story and made for a great ending to the first chapter. Fialkov left us with a Batman wanted by the police and Superman with a story that he has to finish. It is dramatic and works just as well as putting a character in jeopardy on the final page. I also wanted to mention how much the first two pages reminded me of watching LAW AND ORDER. Jimmy Olsen is taking pictures of a wannabe model, asking her out along the way, and they discover a body. That is a classic LAW AND ORDER opening tag and it made me chuckle a bit. I am really looking forward to the next issue. This is one of those rare instances where the ending is obvious (Batman is eventually going to be cleared of the murder and his identity is going to stay safely hidden) but I am still keenly interested in the journey to get to that ending, especially finding out who killed Garrett. Fialkov has given us a solid first issue and I hope the rest of the story lives up to this chapter. Art - 4: Adriana Melo has a really good sense of storytelling as well as making the heroes seem both iconic and human at the same time. Melo knew when to focus in and when to pull back for dramatic effect. The scene on the train was a favorite as was the bit where Clark uses his heat vision to melt the lock on the door and keeping the mugger at bay. These were quiet moments but they were very effective. The full page splash of Batman discovering Garrett's evidence was fantastic and played up the line, "Alfred, we... may have a problem." Some of the figure work was wonky at times, especially Clark at the very beginning of the issue, but other than that the art in this issue was fantastic. Cover Art - 4: I liked the cover. It certainly was effective in getting me interested in the story. My only problem was the giant ad for GREEN LANTERN at the top of the book. I appreciate the fact that DC wants to advertise the film but I think it could have been done in a more subtle fashion.